Ninety percent of business executives believe the Internet of Things (IoT) is important to the future of their organization. And, as IoT is expected to generate a whopping 21% increase in corporate profits by 2022, it’s clear there’s value in adoption. However, there are still plenty of risks that require mitigation through careful planning, cross-functional teamwork and mature security measures. 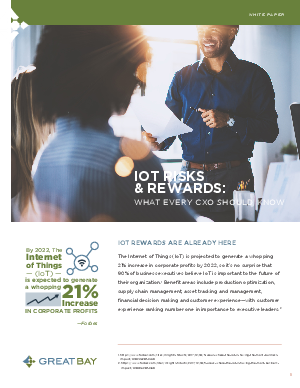 This white paper explores the business benefits and the security complexities IoT introduces for organizations and provides key considerations and recommendations for securing IoT deployments.